LK Collins the naughty alter ego for the husband-and-wife duo behind multiple bestselling and international bestselling novels, brings you a collection of their best works. From second chance love, to tragic love stories, to LK's toe curling sexiness, the Best Of LK Vol. 1 has it all. For Hope Allanis, life has always been filled with regret. The decisions she’d made have put her into bad situation after bad situation. Leading right up to this moment. With the open interstate in front of her, she drives away from the life she once knew. Needing to get away from this place, from this life, and most of all . . . from him. But when her journey on the open road takes Hope to California’s wine country, it feels different. For the first time in forever, it feels right. Chase Hayes has searched for the purpose of life for as long as he can remember. Now, with Hope in town and their instant connection, he feels like he might have found it. The problem is, St. Helena is just another stop for Hope along her journey, not her forever, or is it? Will Hope’s St. Helena getaway lead to the place she can finally settle down and call home, or will it be just another X on the map marked with regret? “Hope!” he yells my name, his desperate words piercing my ears as I slam our front door closed. My blood is boiling in a way it never has before, my emotions all over the place, fighting between anger and rage. Everything I was once so sure of, now all washed away because of one decision he made. Getting into my car, I shut the door and look back at our house. There had been so much promise behind those walls. No, we don’t own it, but we had plans. Plans to one day get married and start a family there. My knuckles are tight around the steering wheel as I remember actually why that dream just died. Betrayal is a nice way to describe it. I grip harder, wanting to take my anger out on something, pretending as if it’ll solve my problems even though I know it won’t. There is not a thing that will solve or fix this. As I drive away, my eyes keep glancing to the rearview mirror, to the house I just stormed from, to the house I will never step foot in again. He lied to me beautifully and had done it for so long that I think he believed what he was doing was okay. I don’t think he realized it wasn’t okay until I caught him and all the lies came crashing out into the open. God, I had not been anything but a puppet in his game of life. Anxious to get away from this place, this city, this life . . . from it all, I turn onto the onramp for the interstate and don’t want to ever look back. My mom’s voice rings in my head, “Please don’t go, Hope.” I should’ve listened to her and never left in the first place. If I had, this never would have happened. It is one of the last things she ever said to me before she had the massive stroke that took her from this world and from me. Her words and panic over my moving away with a man I’d barely known now make so much sense. Had she known how horrible of a man Mitch was and that I’d end up heartbroken? Probably. She also probably stayed silent because she knew I wouldn’t have listened. Or had she begged me to stay because she had known her time was short? I didn’t know if that was something a person knew or not, but I sometimes wondered if my mother had a feeling deep inside her and that was why she wanted me to stay so badly. Regardless, nothing is going to bring her back, and nothing is going to change what Mitch did. My cell phone rings, and when I glance down to see his name and deceitful face across the screen, I roll my window down and impulsively toss the phone out. It bounces against the pavement of the highway. Belatedly, I glance to my mirrors, worried about a car having to swerve to avoid flying projectiles. Thankfully, since it’s so late, there aren’t any other cars around. Pressing harder on the pedal, I wish I could go home. I wish I could crawl into my mother’s arms, but I can’t. My current destination is unknown, and even with the fear of having nowhere to go, the farther away I get from Portland, the better I feel. Ever since moving there to be with Mitch, something inside me hadn’t felt right. God, what I’d do to feel right in my own skin again. I should’ve listened not only to my mom but also to that feeling deep in the pit of my stomach. If I had, maybe then I wouldn’t be in the pain I am now. NOW #LIVE for #99cents or #FREE with KU! Three full length, bestselling, stand-alone novels by LK Collins. Three full length, bestselling, stand-alone novels by LK Collins! For the first time ever, the husband and wife writing duo LK Collins brings you two of their most devastating books. 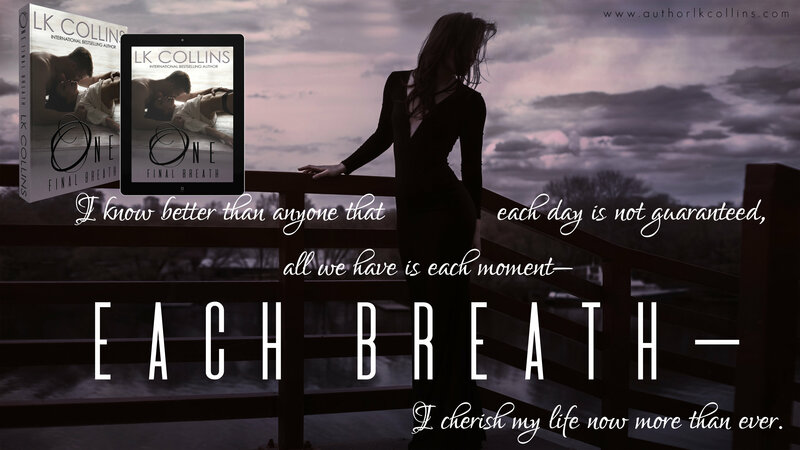 From losing the one you love and learning how to go on again in One Final Breath, to having your whole world crumble around you in One Final Chance, these books are a must have for your LK Collins collection. In addition, LK has included a FREE surprise bonus book that is just as heartbreaking as the first two. But in true LK fashion, each of these stories ends beautifully with their own HEA, no cliffhanger, and can all be read as a stand-alone guaranteed to leave you wanting more. Sometimes itâs all we get and one moment could change it all. I hate the number oneâit haunts me; my every waking moment is a constant reminder of what I lost. He asked me one questionâ¦I said yes. Our life was perfectâ¦until one day everything changed. Leaving me; one woman, one broken heart, one child to show the world toâ¦all alone. What happens when the one youâre meant to be with has been right in front of you all along? All she wanted was for him to stop, but it didnât matterâit was too late. And in that moment, she realized sheâd been blind to the truth for years. Her heart shattered so thoroughly, she couldnât imagine going on. He was her lightâher constantâher salvation. He was her best friend and heâd been there all along, it just took her a while to see what was meant to be, and when she did, she worried it was too late. That sheâd lost her one final chance at love. Plus a full length surprise BONUS BOOK! If you are looking for a scorching read with chemistry so intense it jumps off the pages, then an LK novel is for you. From stand-alones to series, their stories will have you blushing and panting, ready to reread them the moment youâve finished. The heroes are alpha, demanding, filthy-talking men that will do anything for their girlâ¦or to get them. 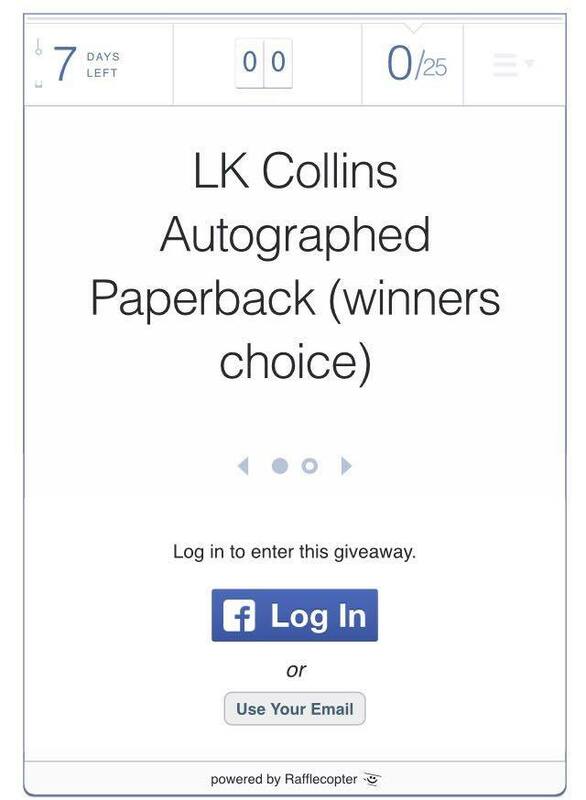 Copyright Â© 2017 AUTHOR LK COLLINS, All rights reserved.